A couple of months ago, we asked for some help from book reviewers, and we got a great response. As a result, we’ve been able to kick up our book reviews recently. And we have more coming down the pipeline for you as well. With that in mind, we wanted to ask which recently-reviewed book your staff most needs to read. Coming out on top (by a wide margin) was Kem Meyer’s Less Clutter, Less Noise. Your church is having a bit of trouble focusing on what matters, opting for the catch-all approach. You want them to know they need to pick one. Next up was Tribes. Some of you have probably read this book already, and some of you probably just know the name of Seth Godin. Either way, you’re ready for your leaders to start taking risks and leading boldly. In a close third was Reimagining Church. It sounds like some of your churches have added so much clutter that they’re losing focus on what the church is meant to be and do. And you’d like them to make a drastic shift. 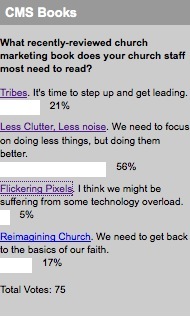 Only 5% of you would prescribe Flickering Pixels to your church staff. I guess it’s not an epidemic that pastors are getting over their head in technology and losing their focus on the message of Jesus Christ. This week, in what’s sure to be a controversial poll, we’re asking: Where do you stand on cussing pastors? Navigate on over to the right sidebar to let us know how you feel.